BarcampAfrica UK is a gathering of technologically inspired Africans and their friends, to be held in London on 7th November. Barcamps are a form of ‘unconference’, events in which the overall focus is declared, but a detailed agenda is only worked out on the day, and people are encouraged to come along prepared to take part in running a workshop. I’m lending my support to the organising team (thus far my main contribution was the logo design), and I plan to facilitate a workshop on the day. The first Barcamp Africa was held last year in northern California, the brainchild of Ellen Petry Leanse and Kaushal Jhalla. There have been several since, one recently in Cameroon. Much of the impetus for the UK barcamp has come from young Africans in the BCS. The overall focus of the event will be on what technology (especially computing and communications technologies) can contribute to positive human, economic and environmental development in the African continent. My Barcamp focus will be on information sharing/publishing. Information design, information sharing and electronic publishing are my personal areas of interest and knowledge. The workshop I intend to run at BarcampAfrica UK will focus on how to make it easier for African institutions to publish and disseminate useful information. A few years ago, I spent a couple of weeks in Ghana. I went over with Ghanaian friends, but spent time wandering around Accra on my own. 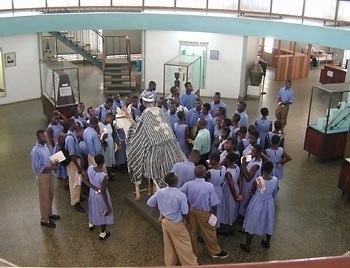 One of my visits was to Ghana’s National Museum, a small circular building that is not well known even to Ghanaians. If you want to get there by taxi, ask to be taken to ‘Edvy’s restaurant’: located within the museum grounds, it is better known than the museum itself!. While browsing the exhibitions, I got talking to the museum’s curator, Joseph Gazari Seini, about methods for captioning exhibits; most of theirs were either typed, or hand-written. I explained the kind of work I do, and he invited me to his office. Pulling out a folder, he showed me the text for a book, a report of some important archaeological work. It had been written on a computer, and the print-out was inkjetted. The folder also contained a collection of colour photographic prints showing aspects of the excavation and the objects found. Joe Gazari explained to me that they would love to get materials like this published, but they didn’t know how to go about it, and they hadn’t the means. I wondered if there was some way I could help, and later that week I had a meeting with Joe’s boss. I’m afraid it ended up with misunderstanding; in retrospect I think they thought I was some rich oburoni offering to finance the whole venture. But what I did do when I got back to England was contact Adobe Systems Inc. Their software — FrameMaker or InDesign, Photoshop and Illustrator — would be excellent tools for book-publishing. I understood that Adobe had some history of charitable giving; would they donate software to this cause? No. They do support projects, but only in their back yard, for example in San Jose, California. And the amount of money it would cost the museum in Accra to buy legitimate copies of professional publishing software would be way beyond their budgets. Is free, open-source software the answer? So this is one of the barriers: the cost of decent software. What about free, open source software? That is certainly a route worth exploring. There is OpenOffice Writer of course, but a word-processing program doesn’t have all the features you would expect of proper publishing software, such as flexible layouts, extensive support of graphics types, and CMYK colour for commercial printing. Another possibility would be to use the venerable typesetting language TeX, invented by Donald Knuth in the 1980s — free implementations are available for a variety of computer operating systems. On the down side, typesetting in TeX is not a WYSIWYG experience: you prepare a file using a text editor, embedding formatting codes, and feed the result to the TeX engine, which does a batch process on the file. The results can be of very good quality and the method has great promise for textbooks, but is difficult if not impossible to lay out publications in which there is an intimate relationship between text layout and graphics. Languages which use the same characters as English, without any diacritics — examples include Swahili, Somali, Zulu, Xhosa. These langauges can even be processed using 7-bit ASCII or sent as telex without orthographic compromise! Languages which use accents but in a way that is similar to Western European languages like French or Portuguese, so can be typeset using standard computer fonts. Examples include Kikuyu and Tswana. Languages which use ‘ordinary’ letterforms but in unusual combinations, such as a dot under a vowel, or an accent over a consonant. These could be typeset with systems like TeX that build accented characters from components. Examples include the Nigerian languages Igbo, Edo and Yorùbá, the Zambian language Nyanja, and Wolof (Senegal). Languages which have additional letterforms that are not found in standard fonts — for example Fulfulde, Krio, Twi and Hausa. Languages which are written with non-latin script systems. Apart from the Arabic script, there is also the Tifinagh script of the Berber people, and the Ge’ez script of Ethiopia and Eritrea. A passage from a text in Yorùbá, typeset using MacTeX and Computer Modern fonts. Click to enlarge. But a lot has happened since. For a start, more publishing software now encodes text in the Unicode system, which allocates a unique character identification number to each letter in all of the world’s languages. There are now fonts available in the extended TrueType and OpenType formats – fonts like Arial Unicode, Lucida Sans Unicode and Adobe’s ‘Pro’ font families – which contain hundreds or even thousands of characters, though usually not the ones which are needed for the African languages I have mentioned. The growth in the number of ‘large glyph set’ fonts has in turn led to the development of mechanisms which make it easier to insert characters for which there is no keyboard keystroke. A good example is the Glyph Palette in Adobe InDesign, and the Character Palette system utility for Mac OSX. What Africa really needs is fonts which contain the glyphs for African languages – and which are free of charge! Fortunately this is now beginning to happen. Gentium, a beautiful font, was designed by Victor Gaultney, originally I believe as part of a research project at The University of Reading. Victor started the drawings for Gentium (the name means of the nations in Latin) in the same year I was conducting my informal research. It now encompasses full extended latin, greek and cyrillic alphabets, is hosted by SIL International, and is available at no charge under the SIL Open Font License, which allows modification and redistribution. SIL International is a Christian organisation with a 75-year history of documenting and supporting the world’s less well known languages. Originally a summer school (Summer Institute of Linguistics’), SIL has grown into an organisation with knowledge of 2,550 languages. It publishes The Ethnologue and has also created a number of fonts that supprt African languages well. Charis is a family of four fonts – roman, italic, bold and bold italic. It is based on Bitstream Charter, originally designed by Matthew Carter, which in 1992 was donated by the Bitstream foundry to the X Consortium. It’s a good start, and there are other initiatives along these lines of which I am aware. A friend of mine, Dave Crossland, recently obtained his Masters at the University of Reading, in the course of which he created a font which he intends to release using an Open Font license. The other day, Dave showed me the font running on his Google Android ’phone, and very crisp and legible it looked too. Although Dave’s font doesn’t have the character support for, say, Twi and Yorùbá, the licensing provisions he has chosen make it possible for other type-wranglers to take the baton and run the next mile. Even TeX doesn’t stand still. In the course of preparing this blog post I found a reference to a brand new version of TeX – XeTeX – which supports Unicode, OpenType and Apple Advanced Typography. It’s also being looked after by SIL, see here!